Raphael Gribetz spends a lot of time getting around on a bike. Year-round, no matter the weather, he usually travels for shopping and recreation by bike, saving gas money, emissions and wear-and-tear on his minivan. At 66, Gribetz has lived about half his life in northern Maine. Educated as an artist in his native New York City, Gribetz and his late wife Nilda moved north in the 1980s and eventually settled down in Presque Isle for a kind of city life that blends the best of urban and rural. They brought with them hard work, enthusiasm for country life and traditions from the Jewish community. “Maine and Aroostook County have been the answer to a lot of my dreams and Nilda’s too,” Gribetz said. Nilda, who died in 2015, earned a degree in social work at the University of Maine Presque Isle and worked for years at the Aroostook Mental Health Center. While Gribetz still mourns her loss, he has channelled his grief into his artwork. His work is featured in the exhibit “A Search for Truth” in Portland with the Bangor Theological Seminary, an organization Gribetz works with on interfaith and multicultural initiatives. “Grief’s magnitude and the capacity to sustain myself through the torrents of grief are central themes in this exhibit,” Gribetz said. 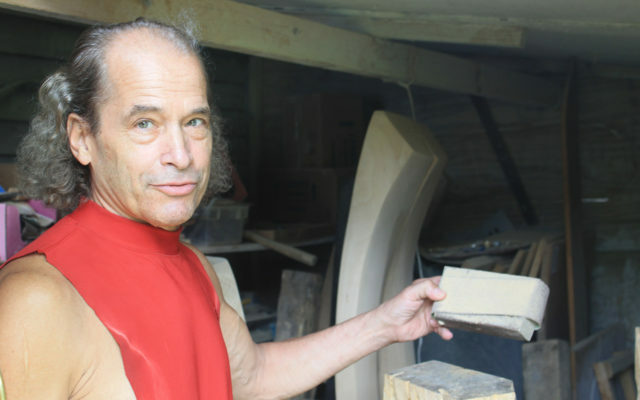 While he lives with that grief, Gribetz also lives a full life that he enjoys — working in his small gardens, making paintings and wood sculptures and, of course, biking. Gribetz puts studded tires on his Cannondale hybrid bike for the winter. Both Gribetz and his wife were born into working class Jewish immigrant families in New York. His parents fled Nazi Germany and anti-semitism in Russia. He and Nilda met in New York City and their process of moving to northern Maine was “gradual,” he said. After a graduate art fellowship in the 1970s, Gribetz drove taxicabs in New York City, eventually owned a small taxi company and even dabbled in real estate. They later moved to Provincetown, Massachusetts, then to Cape Cod, where they grew a small market garden and raised chickens. While camping in the North Maine Woods, they found a property in the Portage area and lived there homesteading for three years before resettling in Presque Isle. They purchased a home next to the bike path, a home that was formerly part of a train station and was later moved to its current location. In addition to creating and selling art, he worked seasonal carpentry jobs and other gigs to get by, such as two stints at McDonald’s. “There’s a lot of dignity in that, doing what you have to do,” he said. Gribetz was part of a wave of baby-boomer back-to-the-landers. He and his wife were satisfied with their blend of rural and urban life living in Presque Isle. Though he can understand why youth may seek to leave the region, he thinks they may also come to realize the under-appreciated aspects of life here and what they can pursue. “I know a lot of young people from here move to cities. At some point, it’s going to get to them how the busyness of the cities really makes people anxious. When people move to the city, everything is really expensive. They’re too busy and working too hard. It’s staggering what it costs for a decent place to live,” Gribetz said.